Is your school “life changing”? This morning our Head Teacher stood in for our Head of 6th during assembly. He shared with us a story, and then asked two questions of our slowly waking year groups. Our student asked to use two, and they were “Life changing” which is possibly the most touching thing a student could say isn’t it? The story came from the picture posted above,from a story which you can read here. 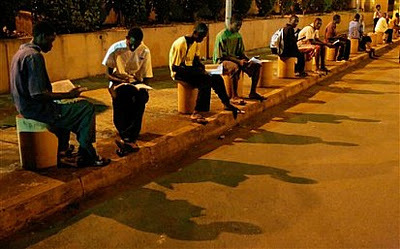 In Guinea electricity is scarce, and the power of education is valued greatly. With this in mind students trek up to an hour away from their homes to find a space to sit beneath the lights of the airport in order to read their study materials and do homework. What lengths will you go to in order to succeed in your studies here? How can you make your school experience life changing? I was stood at the back, where the students (for as long as time has been recorded, and in schools around the country) go to sit and try not to be engaged. The response from the students at the back which I overheard was “wow, man that ‘s a sick thought init? !” I take that to mean it had impact, it certainly made me think! What about you? Care to share that image and those questions to your students? Very thought provoking. Our children take switching on a light and water for granted, but glad to hear it got a reaction.